This windvane system is intended for the control of electrically operated devices which are required to operate only when the wind is blowing from a particular sector. When a windvane is observed in normal weather conditions, it will be seen to be oscillating very rapidly about a mean position. If such a vane were directly connected to an air sampler's pump, there would be a great deal of switching on and off which would damage the pump and give inaccurate results due to the finite time which the pump would take starting up and closing down. It is therefore necessary to build some hysteresis into the system. The simple solution is to introduce mechanical damping by friction or viscosity, but devices of this nature are temperature, time and position dependent and completely unreliable. In this instrument it was decided to allow the vane to oscillate freely in very low-friction bearings and to introduce the hysteresis electronically. A digital Schmitt trigger was therefore devised in order that the performance of the vane would be totally predictable. 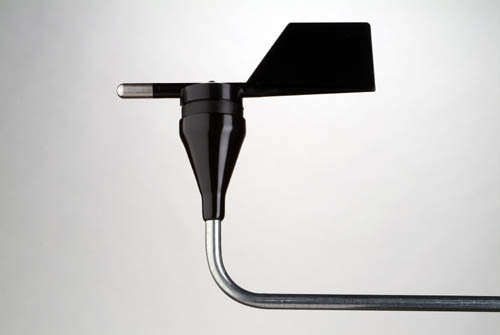 The windvane itself is an NRG instrument containing a precision potentiometer capable of continuous rotation. The electronic system consists of a PIC Microcontroller with ADCs and EEPROM. 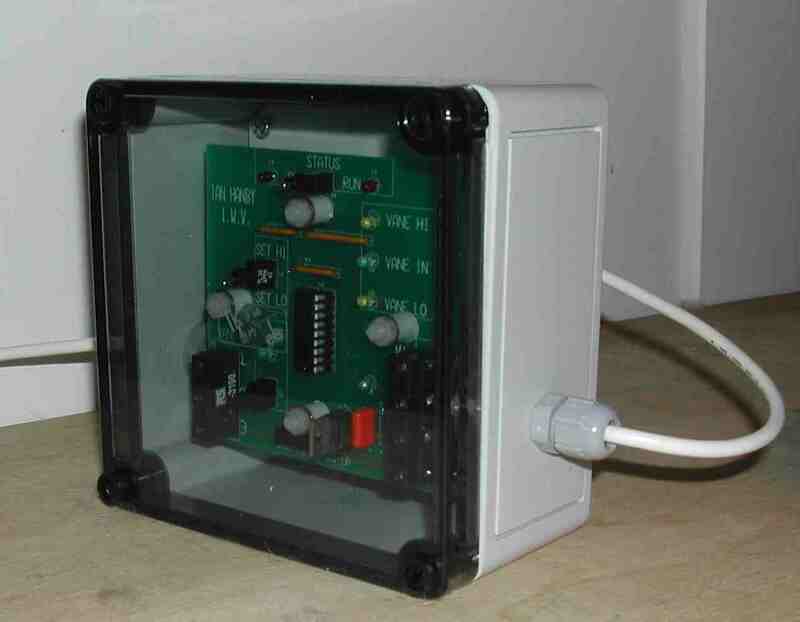 When the device is powered up, a count of 127 is placed in a register. If the window detector sees a signal from the windvane within a pre-settable window, the counter is incremented. If the count reaches 256, the microcontroller sets the output high. If the window detector sees a signal outside the window, the counter is decremented. If the count falls to zero, the microcontroller sets the output to 0 volts. If the status of the windvane changes before the count reaches 256 or zero, the count direction changes but the output will not change until the count finally reaches 256 or zero. The microcontroller is programmed such that the counter takes approximately 30 seconds to perform an uninterrupted count from zero to 256. Various LEDs show whether the windvane is above, within or below the sector, and there is an LED which indicates whether the output is on or off. The window, or acceptance angle, is easily set by the user within the range -170° to approximately +170°on either side of the datum position. The window can be set asymmetrically, eg: -100° to +43°, if required.